Duke Ellington: The Composer, Pt. 1 Duke Ellington composed some of the most enduring music of the 20th century, producing more than one thousand lasting works. With groundbreaking hits such as "Sophisticated Lady" and "Mood Indigo," Ellington vividly communicated universal ideas, while inventing musical concepts that helped elevate jazz to a sophisticated art form. 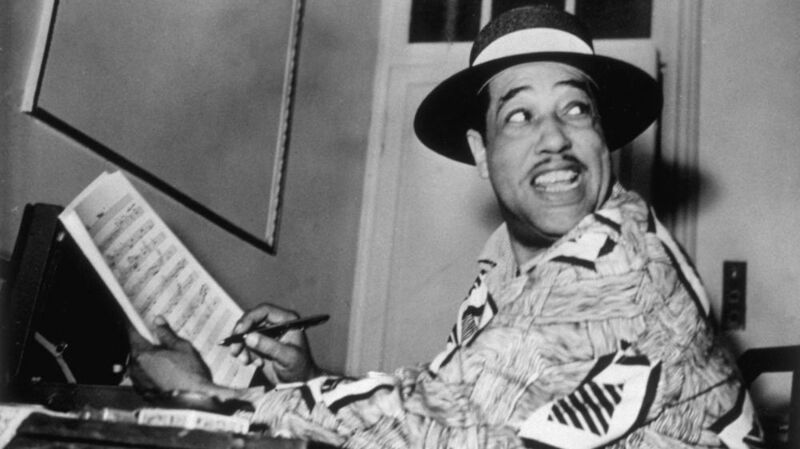 The legendary bandleader and composer Duke Ellington produced more than one thousand lasting works. Duke Ellington composed some of the most enduring music of the 20th century, producing more than one thousand lasting works during a career spanning more than 50 years. "Almost every human emotion is covered in Ellington's music," according to composer James Newton. With groundbreaking hits such as "Sophisticated Lady," "Mood Indigo," "Prelude to a Kiss" and "In a Sentimental Mood," Ellington vividly communicated universal ideas, while inventing musical concepts that helped elevate jazz to a sophisticated art form. Ellington's heightened sense of the human condition enabled him to capture a mood and render it in music. His pieces often told a story, using precise musical imagery enhanced by harmony, rhythm and melodies derived from the blues and other folk idioms. "Practically everything we wrote," Ellington once said, "was supposed to be a picture of something, a representative character." Ellington's mentor, classical composer Will Marion Cook, encouraged Duke to explore his African-American heritage in his music. Pianist and educator Dr. Billy Taylor said that it was Ellington's affection for Harlem-inspired works, such as "Daybreak Express" and "Harlem Airshaft," which effectively reproduced the energy and rhythm of an express train — and gave listeners the sensation of being the train's passengers. Through the performers in his band, Ellington infused his music with a variety of regional influences. Trumpeter Bubber Miley and clarinetist Barney Bigard contributed a New Orleans flavor. And, as trumpeter Wynton Marsalis notes, Ellington himself elaborated on New Orleans style concepts such as polyphonic writing and rhythmic accents. In the trombone section, "Tricky Sam" Nanton came from Jamaica and Juan Tizol from Puerto Rico, while saxophonists Johnny Hodges and Harry Carney came from Boston, and trumpeter Cootie Williams was from Mobile, Ala. All added their unique cultural styles to the band. "In a sense," historian Stretch Johnson says, "the band represented a unity of all of the regional [musical styles]." During a three year engagement at Harlem's famous Cotton Club, Ellington honed his ability to represent a wide variety musical themes and scenarios. The club's elaborate floor shows called for exotic scenes and sounds, and dramatic music to accompany dancers and other performers. While Ellington excelled in this setting, he would soon take his talents into more ambitious territory. With his 1931 piece "Creole Rhapsody," Ellington went well beyond the limits of popular musical form. As composer Gunther Schuller describes it, the work is an ingenious exploration of tonal colors and new instrumental combinations. The length of the piece far exceeded the three minutes that 78 RPM records could hold on one side. In a 1962 interview, Duke recalled the negative reaction of the record company, saying "We just about got thrown off the label." In 1935, Ellington channeled his despair at the loss of his mother, Daisy, into "Reminiscing In Tempo," an extended composition in her honor. As Schuller notes, the work is a set of variations, in the formal, classical sense, but "was totally misunderstood — and heavily criticized." Meanwhile, audiences and critics continued to be drawn to the unique orchestral arrangements that were a hallmark of Ellington's signature sound. One example is the tune "Braggin' In Brass," featuring Ellington's ingenious blending of the diverse styles within his trombone section. Beginning in 1939, Ellington experienced a new surge in creativity, stimulated by the addition of bassist Jimmie Blanton and saxophonist Ben Webster to the band. These musicians brought a driving, rhythmic virtuosity to the orchestra, while adding greater potential to Duke's palette as a composer. Dr. Taylor explains how Blanton expanded the rhythmic vocabulary of the orchestra, as exemplified in numbers like "Jack the Bear," "Ko-Ko" and "Cottontail." Webster's riffs would inspire numbers such as "In A Mellow Tone." As always, Ellington's arrangements brought out the best in his stellar corps of virtuoso musicians.